Comfortable and loaded with interior space just begin to describe the 2019 Volkswagen Jetta. This classic sedan is bigger than previous models while maintaining the precise handling you expect from a VW Jetta. Its turbocharged engine provides quick acceleration, and standard features like leather-trimmed upholstery and ergonomic seating make for a remarkably comfortable ride. For drivers near West Valley, Murray City, and Orem considering a new VW Jetta, Volkswagen SouthTowne is here to help. To see if this sedan is the best choice for you, continue reading our helpful 2019 Volkswagen Jetta review! The standard S trim comes equipped with a 1.4L 4-cylinder turbocharged engine which produces 147 horsepower and 184 lb-ft of torque. This is all connected to either a 6-speed manual transmission or an available 8-speed automatic transmission with front-wheel drivetrain that sits atop 17-inch alloy wheels. Together, this all provides exceptionally responsive handling that maintains well while traveling at high speeds. Available features like Driving Mode Selection allow you to choose between four different driving options, each with their own unique responsiveness and style. If precision steering is what’s important to you, the R-Line trim level comes available with its own Cross Differential System XDS® which automatically applies braking pressure to the inside front wheels, resulting in hyper-accurate cornering. Fuel economy is often an important factor when deciding on a small sedan, and the 2019 VW Jetta performs especially well in this area with an EPA-estimated 30 city/40 highway/34 combined MPG1. This means you’ll be spending a lot more time exploring new places and less time at the pump! The 2019 Volkswagen Jetta’s wheelbase is slightly longer than previous years’ models and can really be felt in the legroom inside the front cabin. The 2019 VW Jetta provides comfortable seating for up to five passengers with 94.7 cubic feet of passenger volume and 14.1 cubic feet of cargo space—perfect for loading up a week’s worth of groceries. Plus, with the 60/40 split-folding rear seats, it’s easy to pack up for the big tailgate on Saturday. You’ll even find there’s extra room inside the interior cubby spaces, door pockets, and center console bin. In terms of staying connected while on the road, the 2019 VW Jetta has you covered with easy-to-use features like a 6.5-inch touchscreen infotainment display, Volkswagen Car-Net® App-Connect, Apple CarPlay™ and Android Auto™ integration, Bluetooth® technology with audio streaming, and a rearview camera system. Above all, Volkswagen puts you and your family’s safety first. 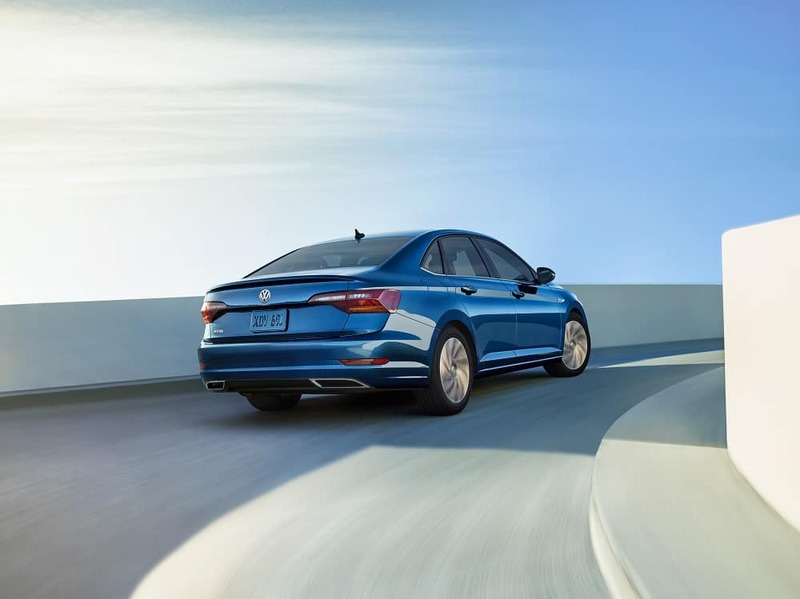 That’s why the 2019 VW Jetta comes standard with a suite of active safety features including Electronic Stability Control, Anti-Slip Regulation, Electronic Differential Lock, Engine Brake Assist, Anti-lock Braking System, Electronic Brake-pressure Distribution, and Hydraulic Brake Assist. No matter what lies on the road ahead, this sporty sedan is up for the task of taking you wherever you need to go. 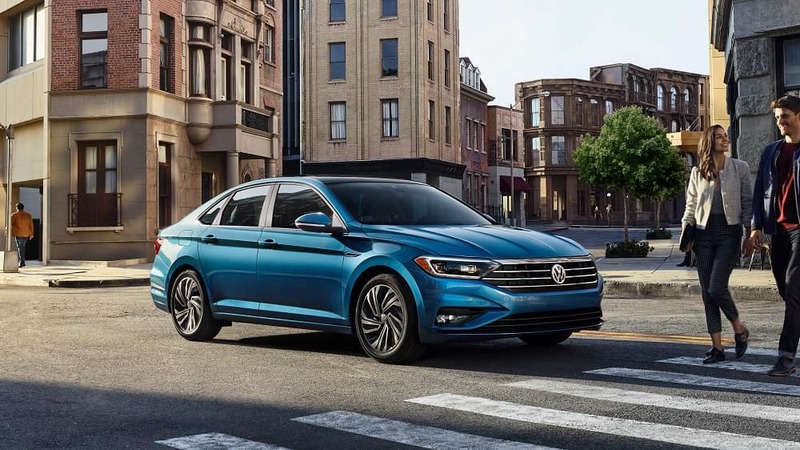 Whether you appreciate it for its peppy and precise performance, exceptionally comfortable interior, or advanced safety features, the 2019 Volkswagen Jetta truly has something for everyone. If you’re a driver near West Valley, Murray City, and Orem, stop by Volkswagen SouthTowne or schedule a test drive today!